-Franklin D. Roosevelt, Remarks on Visiting the Birthplace of Abraham Lincoln. President Roosevelt was a great admirer of Abraham Lincoln. 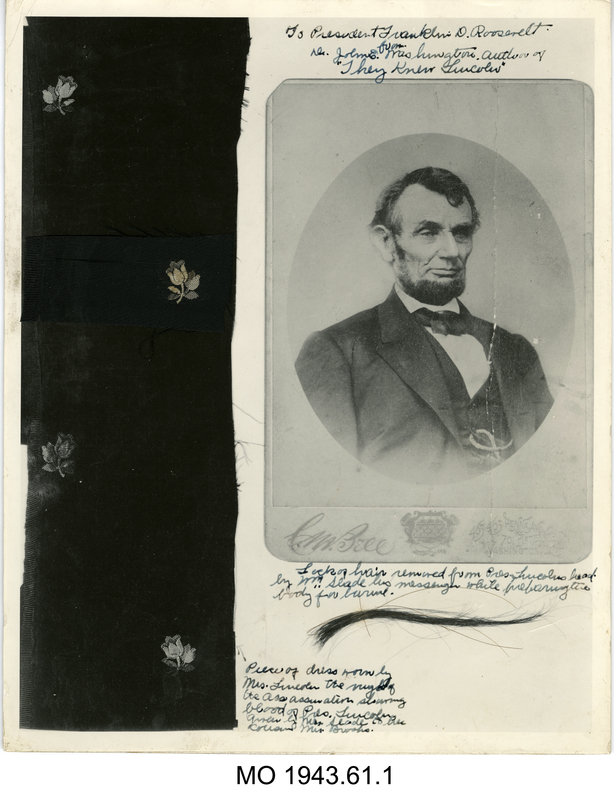 He often cited the revered nineteenth century president in speeches, evoked his image in campaign material, and collected or received over 100 pieces of Lincoln related ephemera. These objects from the FDR Library’s Museum collection reflect the connection between President Roosevelt and President Lincoln. Both FDR and his opponents referred to Lincoln in their campaign material. The poster on the left was used during Roosevelt’s 1932 campaign. The button on the right was used by Republicans in 1940 to criticize FDR’s attempt to seek a third term. Henry Weber of Oakville, Indiana, made this desk piece from the wood of a 350 year old white oak tree that stood beside the trail leading from the Lincoln cabin to the grave of President Lincoln’s mother Nancy Hanks Lincoln in Spencer County, Indiana. Mr. Weber’s son, Horace, was a member of the Civilian Conservation Corps (CCC) in the area and sent the stump of the tree to his father in 1933. The granite piece at the bottom was taken from Devil’s Den at Gettysburg, Pennsylvania. The Webers sent the completed piece to FDR as a gift in 1937. 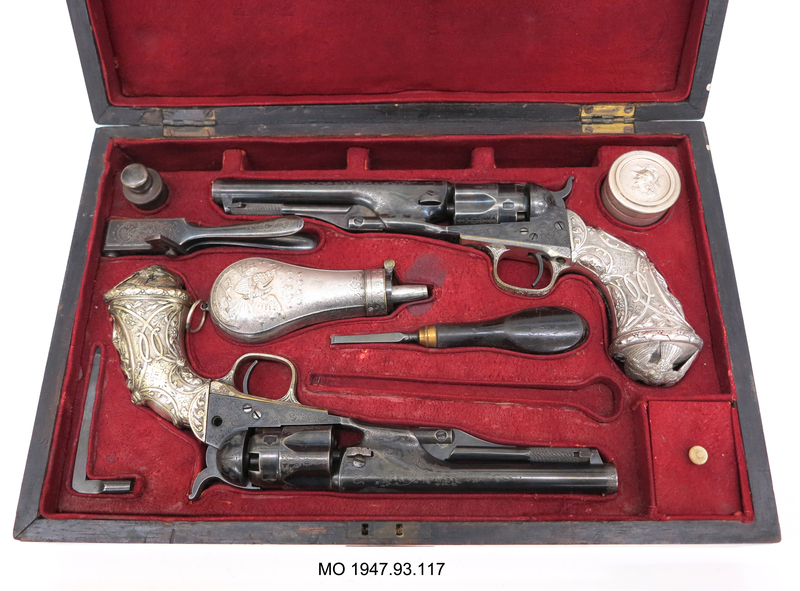 President Lincoln gave this pair of Colt pistols to Kıbrıslı Mehmed Emin Pacha, Governor of Adrianople, Turkey, in 1864. The gift was presented in acknowledgement of his services in securing the assassins of Reverend William Ward Merriam, an American missionary. Rev. Merriam was killed when his caravan was attacked during a return trip from Constantinople to his post at Phillipopolis. In March 1945, the pistols were presented to President Roosevelt by Baron Francis J. Solari of Izmir, Turkey, and Rome, Italy, through Myron C. Taylor, the Personal Representative of the President to Pope Pius XII. The firearms are Model 1862 .36-caliber Colt police pistols, with silver handles by Tiffany, serial numbers 25513 E and 25514 E.